Congratulations to the 2014 IPA 100 Firms. See the Fastest-Growing Firms also. Carmel, Ind. (August 4, 2014) –America’s largest 100 accounting firms are finding ways to grow and expand, but downward pressures on profitability are hitting all areas of the country. INSIDE Public Accounting (IPA) today released its annual ranking and analysis of the financial and operational performance of the nation’s largest 100 public accounting firms. Now in its 24th year, the IPA 100 report continues to be heralded as the most thorough, complete and accurate view of the 100 largest accounting firms in the country, ranked by net revenues. Positive growth in top-line revenues is being seen in almost all areas of the country, a significant difference from last year, when firms on the East and West Coasts were seeing the most growth. “The further we get from the recession, the greater the number of IPA 100 firms we see with positive growth,” says Kelly Platt, principal of the Platt Group, the publisher of IPA. “Ninety-two of the IPA 100 experienced positive organic growth (excluding the effects of mergers) this last fiscal year – a significant improvement over the past five years,” she says. IPA reports that in the years immediately following the recession, IPA 100 firms focused heavily on managing the bottom line, to keep profit margins steady despite declining revenues. Today, much of that energy is focused on building the top line to ensure continued opportunities and resources for partners, staff and clients. This focus on strategic growth has led to an unprecedented number of acquisitions, with more than 40% of the IPA 100 reporting that they merged in other firms last year. Income per partner – one of the metrics that measures the health of the firm – showed positive growth in 70% of the IPA 100, the result of top-line growth, managing the business more efficiently, and increasing staff leverage to a record high of 10 professionals per equity partner. Consolidation continues among some of the IPA 100, with three firms disappearing from the list this year. New York-based Rothstein Kass merged into KPMG; Pittsburgh-based Alpern Rosenthal merged into BDO; and New York-based Holtz, Rubenstein Reminick merged into Chicago-based Baker Tilly Virchow Krause. That consolidation, along with growth among the IPA 100, has moved the bar on the 100th largest firm, which this year reports net revenues of $32.5 million. Three firms debuted this year on the IPA 100: Clifton, N.J.-based SaxBST (FY13 net revenue of $41.9 million) at No. 76; Plano, Texas-based Montgomery Coscia Gerilich (FY13 net revenue of $33.5 million) at No. 97; and Bennett Thrasher (FY13 net revenue of $32.5 million) of Atlanta at No. 100. 27.1% – Average profit margin (net income as a percentage of net revenue), down from 28.0% previous year. Tighter margins – Lower revenues, due to post-recession client demands, and higher wages, as firms compete for limited experienced talent, mean firms are keeping a watchful eye on finances. Leadership changes – Rainmaker partners are retiring now or planning to do so soon, and the next generation of leaders is predominantly oriented toward client service or technical expertise. A growing number of firms don’t have the bench strength to take the firm into the future and pay the retirements of those who built it. Globalization – Clients need answers to complex issues as the economy becomes increasingly integrated. New regulations – Keeping up with ever-changing rules is a constant challenge for the profession. Acquisition pressures – Consolidation within the industry is pressuring firms to get bigger, regardless of whether the strategy is sound. Evolving technology – Rapid change requires firms to adapt quickly to prevent security breaches and other problems. Cultural shifts – Younger employees often have different motivations and expectations than their elders at the firm. Up-and-comers who have “the right stuff” aren’t willing to wait the traditional 12 to 15 years to become partner and will challenge the firm to re-think normal career paths. Fierce competition – A desire to regain market share lost during the recession has led to fee-cutting at unprecedented levels. Work environment challenges – Technology makes it possible for professionals to work anytime, anywhere. Balancing the needs of the individual with the needs of the firm, colleagues and clients can be tricky. Commoditization of services – Firms are struggling to define why they are different from everyone else. Lack of diversity among partners – The ever-diversifying population – in age, ethnicity, language and gender – is not reflected in the makeup of the owners of accounting firms and change is glacially slow. Professional services competition – Clients can get comparable services from someone other than an accountant, or they can go online to get access to services and “how-tos,” putting even more pressure on accounting firms to differentiate themselves. 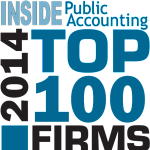 For the complete list of 2014 IPA 100 firms, view an excerpt of the August issue of INSIDE Public Accounting. About The Platt Group and INSIDE Public Accounting: INSIDE Public Accounting (IPA), founded in 1987, is published by The Platt Group. The Platt Group publishes both the award-winning INSIDE Public Accounting newsletter and the award-winning National Benchmarking Report. The Platt Group also advises, consults and helps firms move to a more successful level. With more than 26 years of independent reporting and more than 24 years of surveying and benchmarking experience, The Platt Group works with managing partners, CFOs and thought leaders across the nation to provide practical ideas, benchmarking data and information to take firms to the next level of improvement.